It’s the start of the Year of the Pig, so we thought of sweetening up the celebrations with more delicious options for your new year dinners; some are even open on the second and third day. 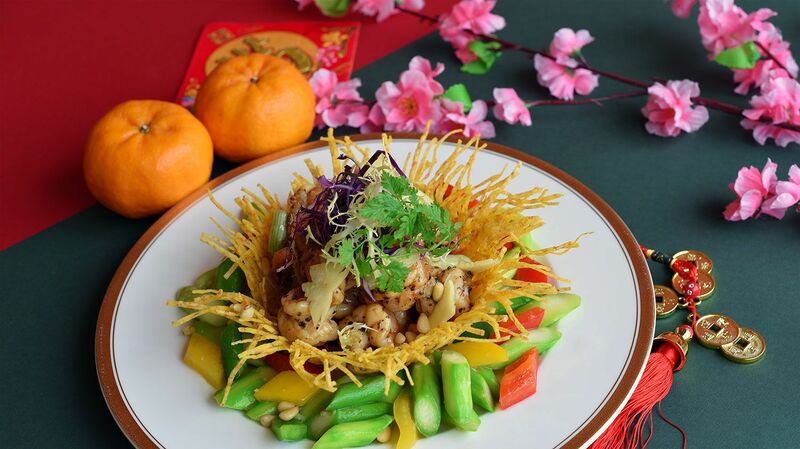 So you’ve finished tossing the Chopsuey Lucky Lunar Lo Hei; now it’s time for the reunion meal and there are two sets to choose from. The first is good for a party of four to six, and commences with a refreshing Gancia Lychee Prosecco or Lychee Green Tea Shake. The meal is composed of addictive chargrilled king prawn sticks with a zingy chilli lime dip; lemongrass and lime poached barramundi; and smoky chilli pepper chicken. If you’re inviting extended family, the second set caters for up to eight diners, and has more inspired dishes, including the sweet chilli king prawns and the sticky five-spiced roast duck. Chef Joey Sergentakis puts his own stamp on your festive celebration with a set menu showcasing original interpretations of beloved classics. After the imaginative yu sheng featuring marinated tuna, oscietra caviar, kampot pepper, calamansi and lemongrass oil, you’ll soon be chomping on the likes of steamed seabass peppered with crushed chilli and soya beans, and lychee wood-smoked duck breast fancified with toasted peanuts, bok choy and Chinkiang vinegar. The highlight is a suckling pig roulade, beautifully prepared with truffle, pearl barley, Chinese ham and crispy shallots, while the dessert of mandarin orange cheesecake rounds up the auspicious meal perfectly. This progressive restaurant didn't miss a beat with its own unique offerings inspired by Chinese New Year classics. What better way to kickstart the meal than with a foie gras terrine dressed with confit duck, mandarin and myoga (Japanese ginger). In the three-course menu, you’ll also see familiar names such as the Buddha Jumps Over The Wall, but instead, these luxurious ingredients are served in a risotto. Of course, there are pineapple tarts, which are served with textures of yoghurt and white miso caramel. This restaurant's festive options are served in set menus designed to the number of diners at your table. Keep a lookout of for the signatures, especially the fragrant X.O. lap cheong pork rib rice wrapped in lotus leaf, which goes extremely well with some hei bee hiam. There are also sautéed prawns perfumed with black truffle; honey glazed char siew and crispy kurobuta pork served together on a platter; and stewed fish noodles flavoured with the restaurant’s specialty housemade X.O. chilli sauce. If you find yourself craving for something less traditional, head to this crafty burger joint for its Mr Vincent Vega, a gourmet pork burger. It’s a mouthful of fluffy brioche buns that cradle a medley of Bavarian-style smoked free range pork, crunchy pickled Granny Smith apple and Chinese spiced braised red cabbage. Completing this inspired essemble is gooey Brie de Meaux cheese and a generous layer of savoury X.O. mayo and ketchup.